Consistency and conventions are two important element of design. By following the existing conventions, anything can be made easy to grasp. Consistency make user feel at home. Universal color code for traffic lights is (red, yellow, and green). Some conventions are must to follow, like stop lights are red and red means stop. Drivers know that it’s a signal of stop. 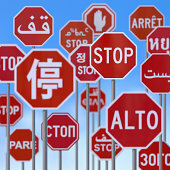 We cannot think of other colors to stop as “red means stop” is universal conventions. Drivers see and recognize them at a glance. And this learning has come from thousands of stop light. Users do not read, they scan the page and designing for scanning is considered to be a best practice. Conventions play vital role when we are designing for scanning. By following existing conventions we make a web page easily scan able. Many conventions for web have been evolved in past many years. User expect the logo to be at top-left corner. Primary navigation at top or down the left side. A search box at home page. breadcrumb listed horizontally at top mostly below the primary navigation. Links in blue color or underline with different color. Shopping cart link at the top right corner. Video icon, search icon, home icon etc. These conventions have not come out suddenly. Idea is started by an individual and convention is made by people. It is somebody’s great idea and if an idea works well, other people start imitating the same and eventually it becomes convention. When user visits your web first time, that user will be carrying his past experience of many sites user has used. His mental model of the way a website is supposed to work may be different. We need to follow the general convention to match with user’s mental model. By following the general web convention; users have not to figure out, what things are and how they work. Designers are hired to do something new and innovative not the same old things. To innovate one has to understand the value of existing conventions. Innovate when you have great and better idea, which should be self-explanatory and no or little learning curve involved in that, otherwise take advantage of the existing conventions. If you want to break the rule, first learn the basic. Designers are expected to be creative and innovative, sometimes consistency is used as a weapon in the argument, by saying, “It will break the consistency”. Consistency is good to strive for, as designer has not to think or reinvent. And user is used to of that. But there may be cases where things will be clearer by making it slightly inconsistence.